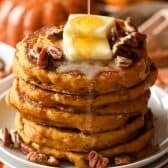 Fluffy pancakes with a light pumpkin flavor and deliciously warm spices are the perfect way to start your day. Combine buttermilk, pumpkin puree, oil, eggs and vanilla in a bowl. Mix together flour, brown sugar, baking powder, baking soda and pumpkin pie spice in a large bowl. Make a well in the center of dry ingredients and pour wet ingredients. Mix just until combined. Allow to rest about 10 minutes. Preheat a skillet or griddle to medium heat. Grease with butter or oil. Pour 1/4 cup batter per pancake and gently spread with the back of a spatula. Cook until lightly browned and the bubbles on top begin to pop. Flip and continue to cook until done. About 4 minutes per side.